Must know where to get this! WoD collector's edition? If this is a Collectors ED mount, I hope it stays a Chimera, and does not change to an alliance gryphon when using on an alli character. It could be WoD collector edition or the new mounts on shop. Possibly linked to the Iron Horde? Collector's Edition: Treasure Goblin (New) Owner of the Diablo III: Reaper of Souls Collector's Edition Treasure Goblin pet. Account Wide. It looks really cool . Nice lizard . Or maybe bird ? Or ? Sorry , but I give up . Link with picture . This mount, or atleast a version of the model, can be seen for a few seconds in the WoD: Faction zones trailer released at Blizzcon 2013. Watch at 0.17 for a closeup. 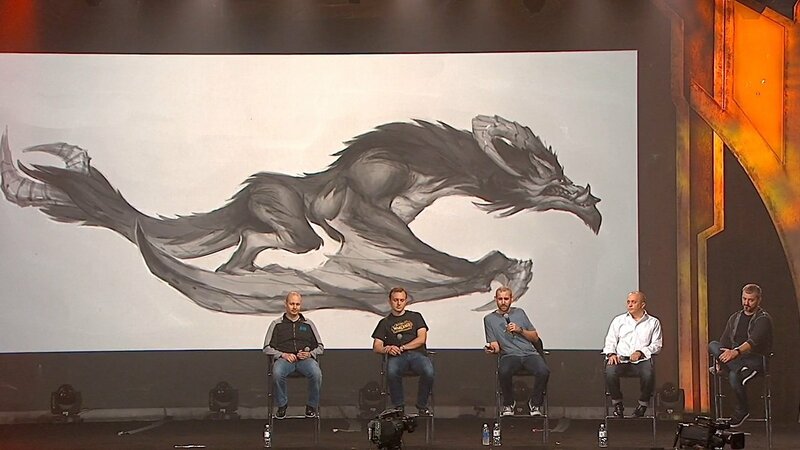 The concept art was revealed at Blizzcon. Expect your mount to look something like this! EDIT: Got the mount on the store. Pretty epic if I may say so myself. It will be from the blizzard store online. Edit: This mount is now available for $25 in the Blizzard Shop. It was first seen on realms that needed a restart, and then introduced with an EU Blizzard post and a special video trailer which can be seen in Quick Facts. This is obtainable in-game only, Blizzard is currently working on making it available via the normal browser store, but there is no ETA. its in PTR in game store, I bought it. On PTR it is obtained by using the PTR test money to purchase this mount off of the bllizzard store, although I highly suspect this is for CE since items for a Collector's Edition of an Expansion are usually created/datamined earliest after an x-pacs announcement. The fact that it's only obtainable on PTR through the store could be to test having mounts on there since the only other thing available atm are pets. It could also just be a way for players to get the mount and test it on PTR without having to put it into a pre-made's list of mounts. I eat a chocolate muffin while I snort party balloon. My theory is that this mount will be the collector's edition mount for Warlords or Draenor, similar to the Quilen mount we saw was given with the CE of Mists of Pandaria. Reason why I strongly believe this is mainly if you check in the 3D model of the Skyreaver it shows a "jetpack" of sorts which resembles an Iron Star alot (those nasty things that roll during the Garrosh Hellscream encounter). Because Blizzard also stated the story of WoD is based around the Iron Horde and that Garrosh takes some of the technology with him to form the Iron Horde with the Iron Star being centralized in most of the war machines during WoD. Must have *falls over in chair* ..
it is a chimaera which happens to be the iron hordes favorite mount i think WOD collectors edition or iron horde stuff drop maybe? I just saw someone with this in game, but he didn't answer where he got it. Nothing's listed, and I didn't see it in the store, so where does it come from? This is not a WoD Collector's Edition mount. It is purchasable from the in-game mounts and pets store for €20 (Or $25 on US servers). You can not purchase this in the online blizzard store, only in-game. This mount can be obtained from the Blizz Store. I got it today 16.01.2014 for 20 Euro. Cost of 20€ available from blizzard in game store. Saw it in action today. Really nice detail and animation, however I would much rather see it be a collectors edition WoD mount or a rare drop to make it special. This mount is now obtainable via blizzard store, so it wont be avilable with wod deluxe edition. Bred for war by brutal Iron Horde beastmasters and girded for battle in black steel and smoldering flame, the monstrous Iron Skyreaver suffers only the most fearsome of masters to ride it. Like a blazing comet foretelling doom and fiery destruction, hurtle down from the heavens upon this epic mount to herald your own campaign of conquest! The Iron Skyreaver is now available for purchase from the in-game Shop! Once purchased, the mount will be available to all present and future characters on a single Battle.net account. Please buy it on a character of at least level 20. Otherwise you will be wasting your time getting GM to transfer it to another toon that can learn it. The mount is delivered to the toon that bought it. It took me a while to figure out why it wasn't showing up in the mount tab. This mount went live today (1/16/14) catching a lot of us by surprise. This mount as of this writing is available ONLY via in-game shop. Buyable from the ingame store for 20 EUR on europe servers. Seem to have a similiar sky golem flying animation altough somewhat altered. You don't sway from side to side all the time like you do in the sky golem and the spin does not launch you forward at all. The mount looks great from standing still, flying and just hovering in the air. I think its a shame that a lot of these unique mounts go straight to the blizzard store, I would have really enjoyed grinding in-game for this. This mount looks awesome on priests in Shadowform and with Jewel of the Firelord looks even better! I hope that someone will submit a screenshot. Here is a picture of Iron Skyreaver in Shadowform. Looks kinda cool, but I'd still much rather spend my $27.50 on over a months worth of games at Steam than just a mount that everybody will lose interest in a week or two. If you are planning to purchase this mount my only suggestion is to find a player that already bought it and see it live for yourself before making your final decision. I saw Blizz's promo video for it and was super hyped and about to press purchase when I decided to check it out in game first. It is much smaller than they make it appear in their video, it is also much less detailed. Also, when you are on the ground with it one of the heads stays lower to the ground than the other. I'm not saying don't buy this mount, I am just saying make sure you actually like what it looks like in game before making your decision based solely off of Blizz's video that they made for the sole purpose of getting people to buy it because, as far as I know, Blizz doesn't do returns on digital purchases. For everyone who doesn't know, it DOES have a ground animation. It lunges forward and uses its wings as front legs. It's kinda like a vampire bat. Only issue for me has been your character doesn't appear to be holding onto the mount in the air. If I pan sideways to check out how the mount looks in-flight, looks like I'm holding onto a patch of air on top of the mount...not a big deal really, it's the same look as Celestial Steed...but for some reason it's really noticeable on this mount and that bugs me. But that's definitely not a deal breaker, glad I got it, looks really cool. Guess if it had say, chains to hold onto like the Armored Bloodwing mount - would have been perfect! After seeing the "Two heads are better than one" on the Blizz advert, I can't stop singing the Dragon Tales theme song whenever I see the Skyreaver in-game. 'Cause you know two heads are better than one! when i first saw it I was like "gosh please someone put that poor thing out of it's misery"
This mount did not give me any credit toward Mount Parade as I am still sitting at 196/200 after adding it to my collection. Apparently, the new Transformers 4 movie will have one of these in it as one of the Dinobots. OK, as a girl for me personally this is not the prettiest mount out there, BUT it's the most fun mount to ride ever. It does sway around and it really does loops in the air. It's really awesome! It's like riding a roller coaster anywhere. So if you like to go on the rocket ride outside Orgrimmar you'll definately like this mount. Those aren't just any jets. Those are powered by small Iron Stars. This is my prized mount, along with the Kor'kron War Wolf, I use this on all of my True Horde toons. Seriously worth the 25 dollars. I'm kind of looking forward to riding this mount. Not a huge fan of the two-headed flying mounts, but I really like the flow of the flying animation on them. Worst model ever. It reminds me of someone beating a dirty carpet over a clothesline. It is quite a nice mount. On sale for half price ($12.50 US) starting today 12/7/2015, in the Blizzard store, along with most other mounts. Get yours before it returns to the regular price! I was on the fence about which mount I liked best in WoW....until I got this one. In my opinion, without a doubt, the coolest mount I have seen since vanilla. Not only is the design sleek and menacing at the same time, but the aerial animations and /mountspecial are fantastic. The glide weave and barrel roll alone were a great surprise, and make this mount worth every coin. Cause one-headed mounts were boring. "Die Bestienmeister der Eisernen Horde haben diesen Rylak für den Krieg gezüchtet und ihn dann mit schwarzem Stahl und qualmenden Flammen für den Krieg gewappnet."